Exequor means “to execute” - to take action, to accomplish, to achieve. In today’s complex, intensely regulated and vastly changed healthcare environment, action and achievement demand knowledge, strategic vision and dynamic leadership. As trusted advisors to the Life Sciences industry, the Exequor Group brings a fresh perspective, creative marketing strategies, and the expertise of leaders in healthcare, sales, and marketing and finance. Our clients are pharmaceutical, biotechnology and medical device manufacturers who trust our counsel and value our leadership. Our services maximize the commercial value of their products in the face of enormous challenges and unprecedented change. Our comprehensive, strategic programs address the full spectrum of Life Science manufacturers’ target markets: providers, payers, patients and professionals. We empower our clients, enabling them to move beyond regulatory challenges to an integrated, effective system and a position of leadership. We identify problems and opportunities using highly advanced market analysis, non-traditional solutions and practical expertise. Let Exequor demonstrate how we can help your firm identify new prospects, forge new markets and thrive in this Brave New World. In the face of complex regulations, competition, market changes and the compelling demands of product commercialization, crucial operational improvements can get sidelined. We’re reminded of the saying “When you’re up to your neck in crocodiles, you forget that the objective was to drain the swamp”. With a fresh perspective, creative marketing strategies, and the expertise of leaders in life sciences commercial operations, sales and marketing, The Exequor Group can help. We provide customized, leading-edge programs that enhance operational efficiencies, reduce costs and improve salesforce productivity. We identify opportunities for process and technology improvements. We develop stringent RFP processes to re-evaluate departmental vendors, significantly reducing costs. A productive salesforce needs more than a mission statement. Exequor’s sales diagnostic thoroughly analyzes the sales forces’ organizational function, providing practical, proven solutions. The result: greater productivity and profits. We pinpoint the activities that increase ROI. Exequor identifies a client’s internal perspectives, aligning them with customers’ values. We determine holistically, the skills needed at every level of the salesforce. We enable our clients to lead the way in forging new and effective commercial operations despite the challenges of regulation and market complexities. Our highly advanced market analysis pinpoints problems and identifies opportunities. Our creative thinking and pragmatic approach, coupled with in depth expertise, turns those possibilities into realities. Medical Affairs, the bridge between the R&D and Commercial organizations, is rapidly growing in importance in realizing product potential in crowded, value-oriented markets. For many Medical Affairs organizations, these markets now demand global delivery while incorporating country-specific needs and the ability to serve customers across multiple channels. Data collected from these channels can provide Medical Affairs with a vast treasure-trove of customer data. Companies that can leverage their product science and capture, extract and apply customer data have a significant competitive advantage. We recognize the complexity of better aligning Medical Affairs with other business functions. 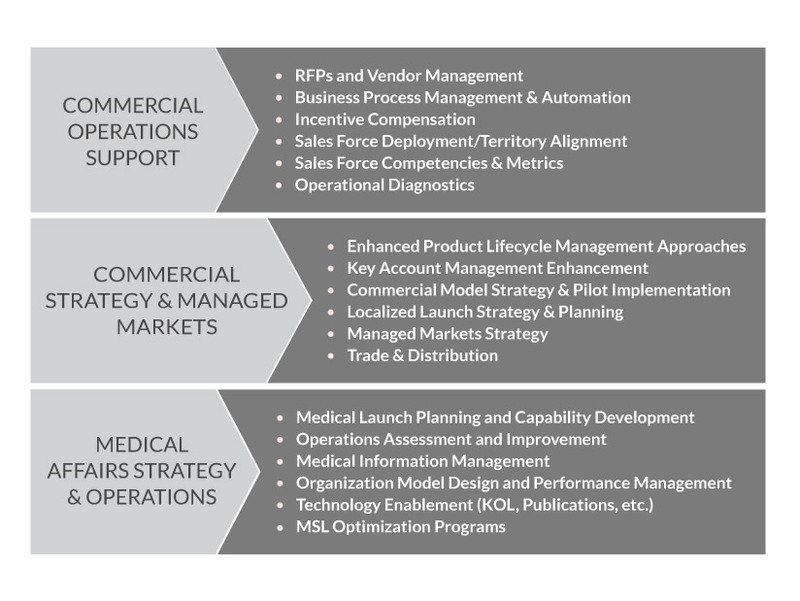 For example, by combining expertise in Medical Affairs and key functions such as Marketing, Sales, and Managed Markets, Exequor can improve launch planning processes and capabilities or improve Field Medical and Sales alignment. Exequor understands customer interaction channels, processing of structured and unstructured data and use of text analytics to help identify key insights in customer data. We help Medical Affairs organizations rapidly and effectively synthesize information. We combine this experience with expertise in process improvement, technology enablement and change management. Exequor can aid in streamlining operations, creating global platforms and training development. We are leaders in selecting and optimizing new technologies, particularly SaaS-based solutions.